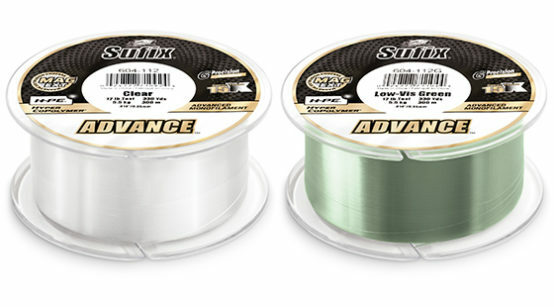 After revolutionizing braided line with 832® Advanced Superline®, Sufix turned its attention to monofilament, creating a durable, low-stretch, abrasion-resistant line that makes no sacrifices that limit performance. There’s some serious science at work making it a breeze to boat fish with Sufix Advance mono. Sufix engineered a proprietary magnetic-extrusion process to draw HMPE molecules toward the surface of the line and bond with the Hyper Copolymer. The result of all that engineering has quickly gained a reputation as the best Monofilament on the market, and has allowed anglers to improve their techniques to land more fish with such an advanced line. For the bass that thinks it’s a bulldog, for the walleye that thinks it’s a freight train, and certainly for the tarpon that thinks, well, it’s a tarpon; Sufix has a new mono that is built to handle and perform against all of these fun and amazing moments on the water. To tick all the boxes a fishing line must test high in eight key characteristics; abrasion resistant, low memory, low stretch, long casting, supple, smooth, sensitive, and slick. Need less stretch when trolling walleye this spring with a new Shad Dancer® – CHECK. Need long distance on that new topwater bait when casting a Arashi® Topwalker – CHECK. Need more sensitivity when jigging walleyes with a Jigging Rap® – Check. Need more abrasion resistance when getting down and dirty bass fishing – CHECK. This line sounds like a braid but it’s not, Sufix Advance Mono simply thinks it’s a braid. Sufix Advance Mono is available in two colors, clear and low-vis green, and nine strengths: 4, 6, 8, 10, 12, 14, 17, 20 and 25 pound test.